B and I went to a shoe store last time. My trusty, silver metallic Cotton-On flats were already tattered and clamouring for a dignified burial and replacement, but I am yet to find the worthy pair of shoes to replace it. I saw a couple of shoes that I loved. The quality was high and the price was slashed. I put them down and debated in my head. “Maybe I can use these flats for 1 more month before I buy a new one.” I thought. I even voiced them out to B. She just looked at me dumbfounded. From that, it hit me --- why am I so quick to spend on my friends, but when it comes to me, I feel guilty about it? As I placed those boots down, I started to explore the many reasons as to why I am actually like that. Days went by, when suddenly another obstacle presented itself. There was a need of big amount of cash and fast! I had half a mind of saying “NO”, but I don’t know why my heart was saying, “Yes please. Give the money”. And so I did and to be honest --- after I did it, I felt bad about it. Although the money will indeed be given back to me sooner or later, one way or another, I can’t shake the feeling that I was back to my old ways again. Needless to say, I have kept on playing the moment leading up to me giving that money. Then it hit me. That moment when this person was explaining the situation to me --- her head lowered to the floor, almost to a bow. Her shoulders folded in. Her back curved downwards. Her eyes on the verge of tears. All these things were familiar to me --- too familiar. It morphed into the memory of my mother back in the day when she would ask money from her friends and family. The amount of shame that she had during those times. She had to do all these begging just to put food on our plate and continue our education. There came a point that no one would be able to. And when I saw her long face --- sad and defeated, I reached out from that can of money I had from the allowance she gave me and I gave it all to her. Her face lit up. She didn’t know that I was saving up all that time and for me, I also didn’t know that it was called “savings”. We ended up having dinner that night. A dinner that was long overdue. My mother was happy. I saw the way that she looked and for the first time a young girl like me, absolutely helped around the house. It is with that memory that I have realized why I spend (at times, beyond my means) on my friends and love ones so quickly. It’s because I don’t want to see that face again. I don’t want anyone that I love feel that shame, guilt, desperation and desolation. As much as I can, I would like to prevent that. And so, even way before my friend/love one needed something, I would already put a band aid on it. Just to never see that face again. I also want to change my view and people’s view of a creditor. You see, when my mother begged to borrow money from other people, when she couldn’t pay them back immediately, they publicly took our stuff. I would remember people going to our house and taking our appliances and possessions one by one. Our neighbors watched on. I can remember the way they whispered to one another. It was just us being publicly shamed over and over. And so, as a creditor, I don’t want to be like that. I vowed to be the good kind of creditor but as such, I only give to those who really need and deserve it. I want to make people feel unashamed for not having enough right now and asking for just the basics. That is why I am always quick to say yes on spending on my friends and loved ones. I love them and I don’t want anyone to go through that feeling of shame ever again. So now, I turn to the other half. Why is it always so hard to spend on myself? For days, I have explored on this matter. But I guess I have to be open and honest now. After my mother died and we were back on our feet financially as a family, I got a job. With that job, came a pay check. And finally, I have financial freedom that is just sitting there and I didn’t know what to do with it. I deserve these shoes. Ding! Goes the cashier. I deserve these clothes. Swipe! Goes the credit card. I deserve these bags. Zip! Goes the wallet. I deserve that expensive travel. Beep! Goes the online travel site. And you know what comes after maxing out your cards? Bills. Bills with high card interest rates. And if you don’t have the money to pay for them in full immediately, it’s going to be more when it comes back. And at that time, I spent more than I earned. Thinking that I can devote my whole pay check to the next bill anyway. Little did I know I was trapping myself more and it was indeed becoming harder and harder for me to get out off. It came to the point that I was living off my credit card, which is not really a great route to go. I was trying to pay it off and for me to use it to continue my life, is like putting in water in a pail that you are desperately trying to empty. The bills became overwhelming. I find myself asking, “how can loving yourself and giving yourself what you deserve be so expensive?” It feels like loving yourself is also punishing yourself. How can a paradox happen? As hard as it was, I knew that I needed a major money make-over. So I did what every independent woman would do --- face the facts, forgive the self and heal it with all my might. I left my credit cards at home. I have changed my whole lifestyle. I started dedicating big amounts of my pay check to paying off all of my credit cards. Soon enough, I have a clean slate. If you must know, this happened to me thrice in different times and ways. And I have definitely learned. I have definitely grown. And as of writing, right now, because of Barri Tessler’s The Art of Money, I am now living the healing journey of my relationship with money. In this path, I have realized that what went wrong is that I did not REALLY know what do I really want to deserve in the first place. I treat myself like a goddess but as a goddess, what kind of offerings do I really want? Did I really want that shoes that I just bought? Did I really want that bag that I just purchased? Did I really want that jewellery that I just got? Did that expensive travel to that island for my 30th birthday please me? (Yes by the way ONLY on the last one). And as years passed by and I went on to heal my money --- I have become more aware of myself and what I really wanted to deserve. This has become a source of a new empowerment tool for me. No longer will material things tell me what I deserve, but now I have accepted my power to dictate on the material things --- Do I really want them and do they deserve to belong in the roster of my possessions? I have realized at this point that the reason that I buy less and become strict with regards to me spending on myself is that the things that I actually do buy are the things that I know are absolutely necessary for me. It’s not that I don’t love myself. I just know that I can live without it. I am actually a firm believer that everything else that I need is already inside or with me. This actually broke the shackles and the hold of materialism on me. This is not to say that I reject all forms of materialism. I am human. I live in a physical world and with that, I need materials to live and create. But I have to remind myself that these materials have to prove that they deserve me. I hold the money. I hold the power in this situation. Not the other way around. So if ever I do have to buy and get things, I have to make sure that I really want it and IT DESERVES ME. With this in mind, I have realized that I should be kind whenever I would tell myself “no” in buying stuff. It’s not because I was being “stringy” or “not loving” myself. It’s because I am now currently learning what really deserves me and my money. If you must know, I did end up buying those 2 flats instead of the boots that I think Carol would have been delighted of. For one thing, I know that Carol does not have that face of despair for a pair of boots she is not even aware of. And the second thing? I do know that these flats deserve to be with me and they are worth my time, style and money. They are high quality and in great price. These flats will serve me well for a long time and because they were made that way, they deserve to be bought by me. 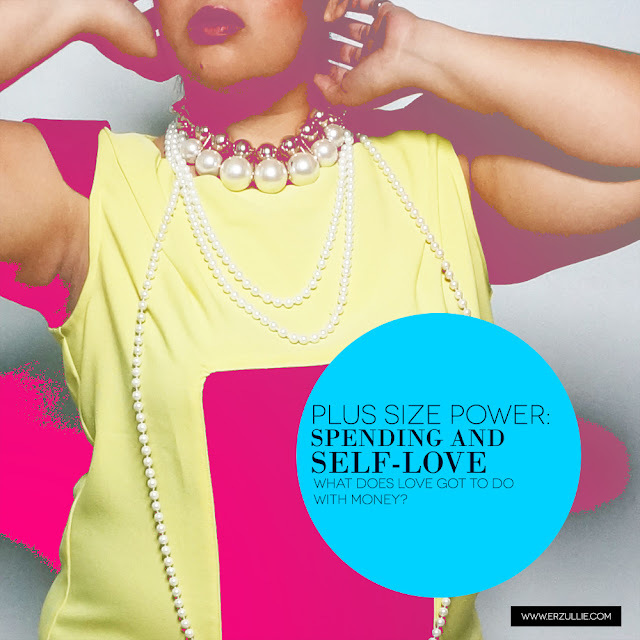 And that is how you reconcile spending with self-love.